t*rexes and tiaras: Friday Favourites 297..
A little bit of living room decor inspiration in today's wishlist, since that's the next room on the list to be redecorated. Before we moved in, we'd discussed a few things we definitely wanted; a log burner in the living room being one of those. We also thought we'd decided on wallpaper (by which I mean I found my dream living room wallpaper and cajoled agreement), but when the sample arrived, I didn't love it as much as I'd expected to - the print was far too big and the background far too dark. So, it was back to the drawing board. With the Wallpaper Direct January sale, I restarted my search and ordered a handful of potential samples and I think we're decided on this one (005). Need to get that ordered! And now that we have more of an idea about colour schemes, everything else seems to just come together. 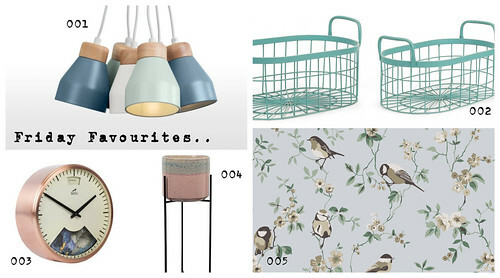 001: I never thought I'd get so excited about shopping for light fittings, but there are some lovely ones out there. I like the mix of colours and textures in this one. 002: Storage baskets like this are destined to keep things like matches and kindling by the fireplace. 003: I can't stop mentioning this clocks - I love them so much. Currently have a savings jar on the go for one of these. 004: Oliver Bonas never fail to come up with some amazing homewares. I love these plant stands - maybe a couple in different heights next to one of the windows? Where to start with making home decor decisions? It's a tricky business, no? I love all of these and now you have me hankering over the clock too! You are right- home decor decisions are fraught! CBC and I don't agree on a lot to do with it which is hard. I can't cajole him- he's super stubborn!